I will probably take heat for this but I have never been a fan of the Air Force 1 silhouette.I can't even defend it because I don't have any reasoning other then I think it looks chunky. Nike will laugh in my face as I am probably the only one who feels this way seeing that since the first Air Force 1 hit the market before my birth in 1982 it has been released in 1,700 colorways and brings in an estimated $800 million USD/year (Elizabeth Wellington). However the Alife Rivington Club Air Force 1 Low might have just changed my mind. Though I am still not a fan of the chunky shoe I can see myself going out and buying this one. 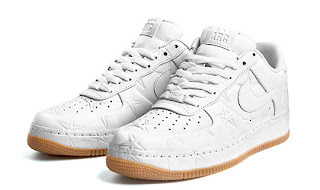 The sneaker comes with a star embossed white leather upper, star embossed inside-out midsoles, buttery gum soles and of course a leather lining. It also features the iconic lacelock that reads “Crispy” (not too sure if I am a fan of that). The Alife Rivington Club Nike Air Force 1 Low will be released in limited quantities on March 14th.